Some jukebox musicals have a clear sense of identity. They’re usually the ones based on films like Footloose or inspired by a band’s back catalogue. Then there are others which are constructed from a string of eighties classics, like the movie Walking on Sunshine, or Club Tropicana. The latter stars X Factor winner Joe McElderry, a likeable bloke whose time on the show many years ago brightened many a weekend before he won the contest and dropped off my radar. Kate Robbins on the other hand has been one of Blighty’s most reliable triple threats for years. A brilliant actor, singer and comedian, although these days she’s perhaps better known as Emily Atack’s mum. The fun takes place at the eponymous Spanish hotel, where the drinks are free (well, some of them) and as luck would have it, is the setting for a bride and groom who got cold feet on their big day. Wouldn’t you know it? They have checked into the same hostelry with their friends by sheer coincidence. Meanwhile, a hotel inspector is looking to close the resort unless they’re impressed by what they see. 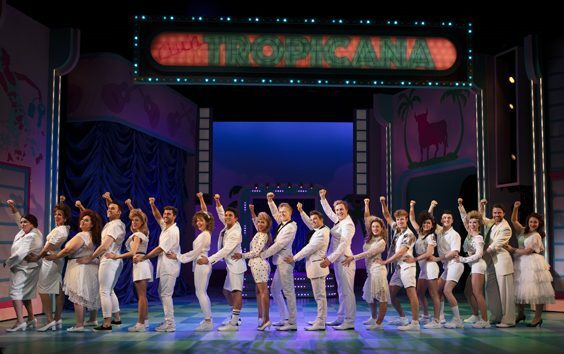 At this point I think this is remarkably similar to Benidorm: The Musical, but there’s enough of a twist to ease that nagging sense of deja vu. The book by Michael Gyngell is a lot of fun, and while many of the gags are far from subtle, on a bleak Monday night, it’s hard not to get carried along with the wave of goodwill. Directors Samuel Holmes and Nick Winston do a fine job of ensuring there’s rarely a dull moment, while Nick Winston’s choreography is also a feast for the eyes. As is the set and costume design by Diego Pitarch. But while your average punter won’t give a hoot about who did what behind the scenes, the front-of-house talent is a joy. 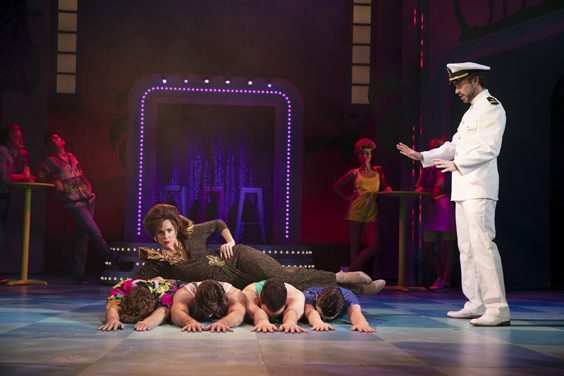 Neil McDermott, Emily Tierney and former Sugababe star Amelle Berrabah all do a terrific job of lifting the spirits, and while the performances are far more solid than the shaky sets, whether intentional or not, even the erratic lift doors add to the comedy. Of course the nostalgic tunes help glue the scenes together, and they’re not always the obvious choices. Kate Robbins’ Spanish cleaner (occasionally channelling Hattie Jacques in Carry On Abroad) and Jill-of-all-trades singing the Minder theme is a curve ball that works surprisingly well. Perhaps far better than ABC’s ‘The Look of Love’, which was more annoying than entertaining in the opening scenes. But going in cold to any jukebox musical is always a bit of a shock to the system, especially when it’s as full on as that track. Some of us need time to adjust to characters and sets rather than be thrown in at the deep end with a chorus of wannabe Martin Frys. 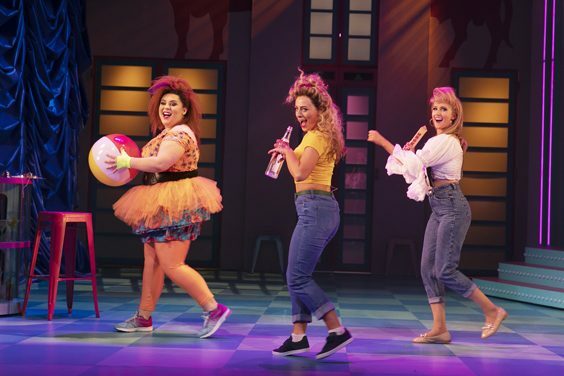 It’s not too much of a surprise when Cyndi Lauper’s Classic ‘Girls Just Wanna Have Fun’ is given an airing, but the biggest laugh of the night is Joe and company’s version of ‘Making Your Mind Up’, for reasons that soon become apparent when you see the show. And any production with the ballad version of A-ha’s ‘Take on Me’ gets my vote, especially when it works as well as this version. McElderry is a great singer, as we all know, but a far trickier gift is comic timing, and he’s a force to be reckoned with on stage. Like Ms Robbins, every time he appears, the show steps up a gear. Yes, I know he’s the star, but it doesn’t always follow that the biggest name on the bill is the most entertaining. Thankfully that’s definitely the case here. While some productions outstay their welcome, this is just the right length for the wafer-thin story. I don’t remember the eighties being as fun as this, probably because they weren’t, but it’s a joy to see a show that has no political agenda. It’s just a feelgood assault on the senses with a bunch of absurdly talented folks doing what they do best. The fact I’d happily see it all again when it plays Hull New Theatre in a few weeks (15 – 20 April) is testament to its success.